Chewy and gooey and fudgy and chocolaty. Uh, Oh. 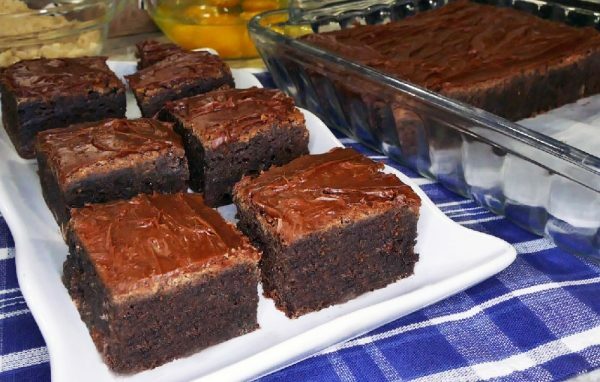 We may have just stumbled upon a brownie recipe that is hard to resist. This recipe has been one of my all-time favorite for many years. If I’m going to splurge on a chocolate brownie, it can’t be crumbly. It can’t be dry. It can’t have enough chocolate in it and it can’t be easy to walk away from. I love this brownie because all of the flavor comes from two types of chocolate and some espresso powder or instant coffee crystals. The coffee is key to any chocolate brownie because that’s what brings out the big, bold flavor of the cacao! I also like that it only has one and a quarter cups of flour in the entire batch. Use nice large eggs and wait until they’re room temperature before you incorporate them into the batter. Why? Because eggs whip up to a greater volume when they’ve had a chance to warm up a bit, and you’ll need the volume since there’s less flour. Yep. These are chewy and gooey and fudgy and fun. Happy Baking! Preheat the oven to 350 degrees. Spray sides and bottom of a 9×13-inch baking pan. (I prefer glass so I can see into it.) Line with parchment paper leaving a 2 inch overhang on two sides. In a medium bowl, whisk together the flour, salt, and cocoa powder. Place dark chocolate, butter and instant espresso powder in a large heat-proof bowl and set over a saucepan of simmering water, stirring occasionally, until the chocolate and butter are completely melted and smooth. Turn off the heat, keeping the bowl over the water and add the sugars. Whisk until combined, then remove the bowl from the pan. When chocolate mixture is at room temperature, add 3 eggs and whisk until combined. Add the remaining eggs and whisk until combined. Add the vanilla and stir. Do not overbeat the batter at this stage or your brownies will be cakey. Sprinkle the flour mixture over the chocolate mixture. Using a rubber spatula (not a whisk), fold the flour mixture into the chocolate until just combined. Don't over mix. Pour the batter into the prepared pan and smooth the top. Bake, rotating the pan halfway through baking, until a toothpick inserted into the center comes up clean, about 30-35 minutes. Remove from oven. Wait 10 minutes, and then cover with plastic wrap. Let the brownies cool completely, then lift them out of the pan using the parchment paper. Cut into squares and serve.